I had no idea how easy homemade croutons are to make. 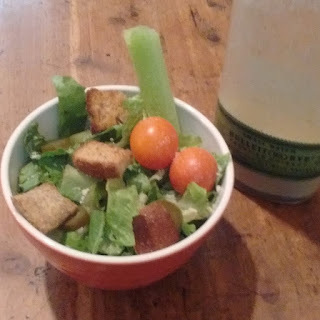 I used to go to Ruby Tuesdays just for their homemade croutons; they are so delicious! It wasn't until a few weeks ago that I had some pretzel buns I needed to use up that I considered making my own for our salad that night. Let's just say they ended up being the star of the meal, and they took the shortest amount of time of everything to make. These end up actually letting your fork pierce them, as opposed to the store bought kind. They are crunchy on the outside, and soft on the inside. Play with the spices and see what might taste good with different meals.